Christmas came early for Louth SPCA this year - with a little help from PayPal. The local animal charity has upgraded its facilities at Walterstown, including the installation of a new gate on the property and a new driveway. On the society's website they revealed the good news today. "Thanks to the Giving Team at PayPal we received a grant earlier this year - and it was put to good use! 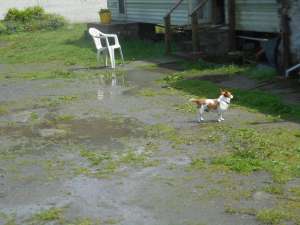 "We have at last gone from a rickety gate and messy yard like in the picture below, to a nice entrance and level surface you can actually walk across. "When it rained, it was embarrassing to say the least as people had to dodge the puddles to get to see the animals! Also for the volunteers welly boots were a must, even in the summer. Now we have a new driveway just in time for this year’s bad weather."